We review the morphology, taxonomy, and phylogenetic relationships of the upper Cretaceous Mongolian troodontid Saurornithoides. Saurornithoides mongoliensis is known only by the holotype from Bayan Zag, Djadokhta Formation. This specimen includes a nearly complete, but weathered, skull and mandibles, a series of dorsal, sacral, and caudal vertebrae, and a partial pelvic girdle and hind limb. Saurornithoides junior, here referred to Zanabazar, also is known only by the holotype from Bugiin Tsav, Nemegt Formation. This specimen consists of a skull and partial mandible, a series of sacral and caudal vertebrae, a partial pelvic girdle, and the distal part of the right hind limb. Saurornithoides + Zanabazar is one of the few Mongolian taxa known from both the Djadokhta and Nemegt formations. The monophyly of Saurornithoides + Zanabazar has not been seriously questioned historically, yet empirical support for this clade is currently tenuous. A privileged phylogenetic relationship between Saurornithoides, Zanabazar, and the North American troodontid Troodon formosus is supported by numerous characters including the presence of a subotic recess, lateroventrally projecting and hollow basipterygoid processes, a lacrimal whose anterior process is significantly longer than its posterior process, a highly pneumatized parasphenoid rostrum, a constricted neck of the occipital condyle, a symphyseal region of the dentary that is slightly recurved medially, and an obturator process located near the middle of the ischiadic shaft. CT data for the skulls of both species facilitated a description of the endocranial anatomy of Saurornithoides mongoliensis and Zanabazar junior, including a reconstruction of the endocranial space of Zanabazar junior (see Additional Imagery). Despite being the largest of the known troodontid species, the endocranial volume of Zanabazar junior is considerably smaller than that estimated for Troodon formosus, suggesting that the extremely high encephalization quotient of Troodon formosus may be autapomorphic among troodontids. This specimen, the holotype, was collected from the Upper Cretaceous locality of Bayan Zag by Henry Fairfield Osborn. It was made available to the University of Texas High-Resolution X-ray CT Facility for scanning by Dr. Mark Norell of the American Museum of Natural History. This specimen was scanned by Richard Ketcham on 2 May 1998 along the coronal axis for a total of 482 slices. Each 512 x 512 pixel slice is 0.5 mm thick, with an interslice spacing of 0.4 mm (for a slice overlap of 0.1 mm) and a field of reconstruction of 73 mm. Balanoff, A.M., X. Xu, Y. Matsufune, Y. Kobayashi, and M. Norell. 2007. Endocranial anatomy of a primitive oviraptorosaur, Incisivosaurus gauthieri (Theropoda: Dinosauria). Journal of Vertebrate Paleontology 27(suppl. to 3): 43A. Barsbold, R. 1974. Saurornithoididae, a new family of small theropod dinosaurs from central Asia and North America. Palaeontologia Polonica 30: 5–22. Barsbold, R., and H. Osmo´ lska. 1999. The skull of Velociraptor (Theropoda) from the Late Cretaceous of Mongolia. Acta Palaeontologica Polonica 44: 189–219. Barsbold, R., H. Osmo´ lska, and S.M. Kurzanov. 1987. On a new troodontid (Dinosauria, Theropoda) from the Early Cretaceous of Mongolia. Acta Palaeontologica Polonica 32:121–132. Baumel, J.J., and L.M. Witmer. 1993. Osteologia. In J.J. Baumel, A.S. King, J.E. Breazile, H.E. Evans and J.C. Vanden Berge (editors), Handbook of avian anatomy: Nomina anatomica avium. 2nd ed. Publications of the Nuttal Ornithological Club 23: 45–132. Benton, M.J. 2000. Mongolian place names and stratigraphic terms. In M.J. Benton, M.A. Shishkin, D.M. Unwin and E.N. Kurochkin (editors), The age of dinosaurs in Russia and Mongolia: xxii–xxviii. New York: Cambridge University Press. Bever, G.S., and M.A. Norell. 2009. 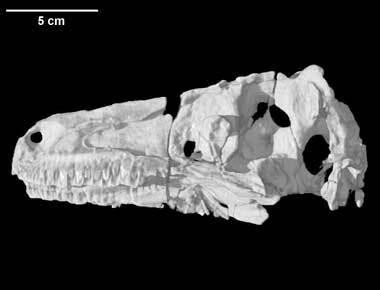 The perinate skull of Byronosaurus (Troodontidae) with observations on the cranial ontogeny of paravian theropods. American Museum Novitates 3657: 1–51. Brochu, C.A. 2000. A digitally rendered endocast for Tyrannosaurus rex. Journal of Vertebrate Paleontology 20: 1–6. Chiappe, L.M., S.-A. Ji, Q. Ji, and M.A. Norell. 1999. Anatomy and systematics of the Confuciusornithidae (Theropoda: Aves) from the Late Mesozoic of northeastern China. Bulletin of the American Museum of Natural History 242: 1–89. Currie, P.J. 1985. Cranial anatomy of Stenonychosaurus inequalis (Saurischia, Theropoda) and its bearing on the origin of birds. Canadian Journal of Earth Sciences 22: 1643–1658. Currie, P.J. 1987. Bird-like characteristics of the jaws and teeth of troodontid theropods (Dinosauria, Saurischia). Journal of Vertebrate Paleontology 7: 72–81. Currie, P.J. 1997. Braincase anatomy. In P.J. Currie and K. Padian (editors), Encyclopedia of dinosaurs: 81–85. San Diego, CA: Academic Press. Currie, P.J., and Z. Dong. 2001. New information on Cretaceous troodontids (Dinosauria, Theropoda) from the People’s Republic of China. Canadian Journal of Earth Sciences 38: 1753–1766. Currie, P.J., and J.H. Peng. 1993. A juvenile specimen of Saurornithoides mongoliensis from the upper Cretaceous of northern China. Canadian Journal of Earth Sciences 30: 2224–2230. Currie, P.J., and D.J. Varricchio. 2004. A new dromaeosaurid from the Horseshoe Canyon Formation (Upper Cretaceous) of Alberta, Canada. In P.J. Currie, E.B. Koppelhus, M.A. Shugar and J.L. Wright (editors), Feathered dinosaurs: 112–132. Bloomington: Indiana University Press. Currie, P.J., and X.-J. Zhao. 1993. A new troodontid (Dinosauria, Theropoda) braincase from the Dinosaur Park Formation (Campanian) of Alberta. Canadian Journal of Earth Sciences 30: 2231–2247. Dingus, L., D.B. Loope, D. Dashzeveg, C.C. Swisher, III, C. Minjin, M.J. Novacek, and M.A. Norell. 2008. The geology of Ukhaa Tolgod (Djadokhta Formation, upper Cretaceous, Nemegt Basin, Mongolia). American Museum Novitates 3616: 1–40. Dominguez-Alonso, P., A.C. Milner, R.A. Ketcham, M.J. Cookson, and T.B. Rowe. 2004. The avian nature of the brain and inner ear of Archaeopteryx. Nature 430: 666–668. Forster, C.A., S.D. Sampson, L.M. Chiappe, and D.W. Krause. 1998. The theropod ancestry of birds: new evidence from the Late Cretaceous of Madagascar. Science 279: 1915–1919. Franzosa, J., and T. Rowe. 2005. Cranial endocast of the Cretaceous theropod dinosaur Acrocanthosaurus atokensis. Journal of Vertebrate Paleontology 25: 859–864. Gao, K., and M.A. Norell. 2000. Taxonomic composition and systematics of Late Cretaceous lizard assemblages from Ukhaa Tolgod and adjacent localities, Mongolian Gobi Desert. Bulletin of the American Museum of Natural History 249: 1–118. Gauthier, J.A. 1986. Saurischian monophyly and the origin of birds. In K. Padian (editor), The origin of birds and the evolution of flight. Memoirs of the California Academy of Sciences 8: 1–55. Gilmore, C.W. 1924. On Troodon validus, an ornithopodus dinosaur from the Belly River Cretaceous of Alberta, Canada. Bulletin of the Department of Geology, University of Alberta 1: 1–43. Gower, D.J., and E. Weber. 1998. The braincase of Euparkeria, and the evolutionary relationships of birds and crocodilians. Biological Reviews 73: 367–411. Hopson, J.A. 1979. Paleoneurology. In C. Gans, R.G. Northcutt and P. Ulinski (editors), Biology of the Reptilia. Vol. 9: 39–146. London: Academic Press. Howse, S.C.B., and A.R. Milner. 1993. Ornithodesmus — a maniraptoran theropod dinosaur from the lower Cretaceous of the Isle of Wight, England. Palaeontology 36: 425–437. Hwang, S.H., M.A. Norell, Q. Jin, and K. Gao. 2004. A large compsognathid from the Early Cretaceous Yixian Formation of China. Journal of Systematic Palaeontology 2: 13–30. Jerison, H.J. 1973. Evolution of the brain and intelligence. New York: Academic Press, 482 pp. Jerzykiewicz, T., and D.A. Russell. 1991. Late Mesozoic stratigraphy and vertebrates of the Gobi Basin. Cretaceous Research 12: 345–377. Kundrát, M. 2007. Avian-like attributes of a virtual brain model of the oviraptorid theropod Conchoraptor gracilis. Naturwissenschaften 94: 499–504. Kurochkin, E.N., and R. Barsbold. 2000. The Russian-Mongolian expeditions and research in vertebrate paleontology. In M.J. Benton, M.A. Shishkin, D.M. Unwin and E.N. Kurochkin (editors), The age of dinosaurs in Russia and Mongolia: 235–255. New York: Cambridge University Press. Kurochkin, E.N., G.J. Dyke, S.V. Saveliev, E.N. Perushov, and E.V. Popov. 2005. A fossil brain from the Cretaceous of European Russia and avian sensory evolution. Biology Letters 3: 309–313. Kurzanov, S.M., and H. Osmo´ lska. 1991. Tochisaurus nemegtensis gen. et sp. n., a new troodontid (Dinosauria, Theropoda) from Mongolia. Acta Palaeontologica Polonica 36: 69–76. Larsson, H.C.E., P.C. Sereno, and J.A. Wilson. 2000. Forebrain enlargement among nonavian theropod dinosaurs. Journal of Vertebrate Paleontology 20: 615–618. Loope, D.B., L. Dingus, C.C. Swisher, III, and C. Minjin. 1998. Life and death in a Late Cretaceous dunefield, Nemegt Basin, Mongolia. Geology 26: 27–30. Makovicky, P.J. 1995. Phylogenetic aspects of the vertebral morphology of Coelurosauria (Dinosauria: Theropoda). Unpublished M.S. thesis., Copenhagen University. Makovicky, P.J., and M.A. Norell. 2004. Troodontidae. In D.B. Weishampel, P. Dodson and H. Osmo´ lska (editors), The Dinosauria: 184–195. Berkeley: University of California Press. Makovicky, P.J., S. Apesteguía, and F.L. Agnolín. 2005. The earliest dromaeosaurid theropod from South America. Nature 437: 1007–1011. Makovicky, P.J., M.A. Norell, J. Clark, and T. Rowe. 2003. Osteology and relationships of Byronosaurus jaffei (Theropoda: Troodontidae). American Museum Novitates 3402: 1–32. Martin, G.R. 1985. Eye. In A.S. King and J. McLelland (editors), Form and function in birds 3: 311–373. New York: Academic Press. Middleton, K.M. 2001. The morphological basis of hallucal orientation in extant birds. Journal of Morphology 250: 51–60. Norell, M.A., and S.H. Hwang. 2004. A troodontid dinosaur from Ukhaa Tolgod (Late Late Cretaceous Mongolia). American Museum Novitates 3446: 1–9. Norell, M.A., and P.J. Makovicky. 1997. Important features of the dromaeosaur skeleton: information from a new specimen. American Museum Novitates 3215: 1–28. Norell, M.A., and P.J. Makovicky. 1999. Important features of the dromaeosaur skeleton II: information from newly collected specimens of Velociraptor mongoliensis. American Museum Novitates 3282: 1–45. Norell, M.A., P.J. Makovicky, and J.M. Clark. 2000. A new troodontid theropod from Ukhaa Tolgod, Mongolia. Journal of Vertebrate Paleontology 20: 7–11. Norell, M.A., J.M. Clark, A.H. Turner, P.J. Makovicky, R. Barsbold, and T. Rowe. 2006. A new dromaeosaurid theropod from Ukhaa Tolgod (Ömnögov, Mongolia). American Museum Novitates 3545: 1–51. Novas, F.E., and D. Pol. 2005. New evidence on deinonychosaurian dinosaurs from the Late Cretaceous of Patagonia. Nature 433: 858–561. Osborn, H.F. 1924. Three new Theropoda, Protoceratops zone, central Mongolia. American Museum Novitates 144: 1–12. Osmólska, H. 1987. Borogovia gracilicrus gen. et sp. n., a new troodontid dinosaur from the Late Cretaceous of Mongolia. Acta Palaeontologica Polonica 31: 133–150. Russell, D.A. 1969. A new specimen of Stenonychosaurus from the Oldman Formation (Cretaceous) of Alberta. Canadian Journal of Earth Sciences 6: 595–612. Russell, D.A., and Z.-M. Dong. 1993. A nearly complete skeleton of a troodontid dinosaur from the Early Cretaceous of the Ordos Basin, Inner Mongolia, People’s Republic of China. Canadian Journal of Earth Sciences 30: 2163–2173. Turner, A.H., S.H. Hwang, and M.A. Norell. 2007a. A small derived theropod from Öösh, Early Cretaceous, Baykhangor Mongolia. American Museum Novitates 3557: 1–27. Turner, A.H., D. Pol, J.A. Clarke, G.M. Erickson, and M.A. Norell. 2007b. A basal dromaeosaurid and size evolution preceding avian flight. Science 317: 1378–1381. Varricchio, D.J. 1997. Troodontidae. In P.J. Currie and K. Padian (editors), Encyclopedia of dinosaurs: 749–754. San Diego, CA: Academic Press. Witmer, L.M. 1997. Craniofacial air sinus systems. In P.J. Currie and K. Padian (editors), Encyclopedia of dinosaurs: 151–159. San Diego, CA: Academic Press. Xu, X., and M.A. Norell. 2004. A new troodontid dinosaur from China with avian-like sleeping posture. Nature 431: 838–841. Xu, X., M.A. Norell, X.-L. Wang, P.J. Makovicky, and X.-C. Wu. 2002. A basal troodontid from the Early Cretaceous of China. Nature 415: 780–784. To cite this page: Dr. Mark Norell, P.J. Makovicky, G.S. Bever, A.M. Balanoff, J.M. Clark, R. Barsbold and T. Rowe, 2009, "Saurornithoides mongoliensis" (On-line), Digital Morphology. Accessed April 25, 2019 at http://digimorph.org/specimens/Saurornithoides_mongoliensis/.